Satya Group Presents “Satya Hive” located at Sector 102 Dwarka Expressway, Gurgaon an upcoming commercial Project offered High Street premium Retail Shops and Food Courts. It’s a new-age commercial hub that takes the concept of integrated business approach to greater heights. Satya Hive located in Sector -102, , the project is spread across 6 acres approx. Master-planned by leading Architects, the development would offer High Street Retails Shops, Business Suites and Entertainment Zone comprising of multiplex, Food Court, kids play area, etc. SATYA Group is coming up with Satya Commercial, a product mix of retail shops, showrooms, anchor stores, restaurants, multiplexes, food court, entertainment zones and serviced apartments accessible through Sector 102 Dwarka Expressway, Gurgaon. The project is well equipped with all modern amenities and 24X7 security service to facilitate the business needs. On Dwarka Expressway, Sector-102, with premium residential apartment of other developers in the vicinity. Approx 6.0 acres site located in Sec – 102. 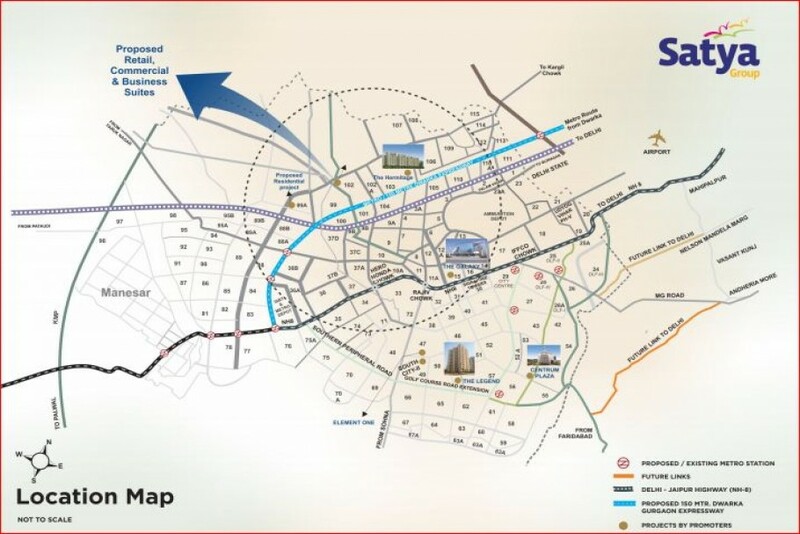 3 Side open project, Right on 75 Mts Road Leading Directly To Diplomatic Enclave and IGI. Strategically located along 75 meter Sector Road and State Highway. 15 min from International Airport. Excellent connectivity to proposed metro. 15 min drive from NH8. Premium Townships & Group housings in vicinity to ensure ample footfall. Electric mix of Retail Shops, Showrooms, Anchor Stores, Restaurant, Entertainment Zone & Serviced Apts. The retails shops, offices, showrooms and anchor stores are on Ground Floor. The entertainment zone comprises of the food court, multiplex and other amenities. Food Court, Multiplex, Hyper Mart, Car Showroom. Retails shops, offices, showrooms and anchor stores. 1 | 2 BHK Serviced Apartments | Restaurants | Entertainment zone | kids Playing area. Open to sky, Less Maintenance, 3 side open site. Located in Sector 102 Dwarka Expressway Gurgaon. Satya Group Founded in 1958 by the name of Ashoka Builders, the Group is the brainchild of great visionary Mr. Nawal Kishore Agarwal. He started with some residential and commercial development in Delhi, in areas such as Hauz Khas, Greater Kailash -2 and Bengali Market. He moved to Kolkatta in the year 1972 and undertook few developments in Burra Bazaar area and moved back to delhi in the year 1976 to undertake projects in areas such as Patel Nagar and Civil lines. in 1999, the Group was named as Satya Group and headquartered in Gurgaon.